When the murderers of Archbishop Thomas Becket sliced off the top of his head and scattered his brains on the pavement stones of Canterbury Cathedral, they could hardly have imagined the fascination their victim’s life would attract for centuries to come. The son of a prosperous London merchant, Becket had risen rapidly to become the chancellor of England and later archbishop of Canterbury. In his position as the leading royal official of the kingdom, he quickly formed a close bond with the young King Henry II and became his trusted advisor. After Henry appointed him archbishop, however, he unexpectedly resigned the chancellorship. Becket and Henry’s friendship soon soured, and conflict over the respective rights of church and crown arose. As the dispute escalated, Henry tried Becket on trumped up charges of embezzlement, leading to Becket’s flight from England, not to return for six years. In a vivid new biography of Becket, the Tudor historian John Guy clearly and concisely traces the steps of the long and complicated controversy, as well as its role in international politics. Guy sets out to draw a balanced portrait of Becket, sifting the hagiographers’ accounts and the post-Reformation biases of English historians. A confessional divide overshadowed interpretations of Becket ever since another King Henry VIII declared Becket a traitor to king and country. Henry VIII destroyed Becket’s shrine and attempted to erase all images and mention of him in England. Even in the 20th century, English historians concluded that Becket was the cause of his own troubles, picking fights and remaining obstinate when compromise was needed. Becket’s speedy rise from commoner to chancellor had made him arrogant and proud, these critics say; he was no saint, but brought on his own martyrdom through his self-righteousness. Guy does not play the blame-the-victim game. He balances the duplicitous and untrustworthy behavior of Henry II with attention to Becket’s missteps and failures. Guy tries to show that Becket was “far from saintly or infallible.” He avoids “the trap” Becket’s hagiographers’ fell into—of “writing the history of the saint without his shadow.” Guy intends to humanize St. Thomas, a sometimes necessary task for saints since their holiness is often emphasized at the expense of their humanity. But Becket was, in fact, one of the most fallible of saints. Because of his notoriety as a luxury-loving, extravagant social climber, his hagiographers were forced to acknowledge many facts that they might otherwise have omitted. They noted that Becket loved hunting and falconry—the elite sports of the time. They are forced to address the fact that, as King Henry II’s chancellor, Becket led an army in battle and forced questionable royal taxes on the church. His hagiographers had to admit that even after Becket became archbishop of Canterbury and resigned the chancellorship, he made a number of mistakes in his dealings with King Henry, foremost among them his loss of nerve at the Council of Clarendon, where he swore an oath to uphold Henry’s customs, which limited the church’s freedom, and then reversed himself immediately. In his attempt to humanize Becket, Guy dismisses the question of whether, despite his faults and foibles, Becket was a true martyr and saint. Guy comments that the search for an answer has been “fruitless” and that Becket’s worldly wise friend John of Salisbury would find Becket’s canonization “utterly absurd.” John of Salisbury was aware of Becket’s faults from years of working closely with him, but Guy’s claim is incompatible with the fact that John wrote a saint’s life in support of Becket’s cause for canonization. John of Salisbury and all of Becket’s friends were shocked by his murder. They could only try to explain things from the vantage point of his martyrdom. Looking back over his life, they began to see the signs of change and conversion without which his bravery in the face of martyrdom would have been inexplicable. How else could they reconcile his less than saintly behavior with his final courageous stand for the church’s rights? As they considered his life, they noted changes in his religious observance and devotion that occurred after he became archbishop. They argued that his resignation of the chancellorship after becoming archbishop showed that he placed his responsibility to the church first and foremost, and they were not wrong to do so, since archbishops before and since often held both offices. What one makes of Becket’s life and character turns significantly on one’s assumptions about a person’s ability to change, especially to change for the better. 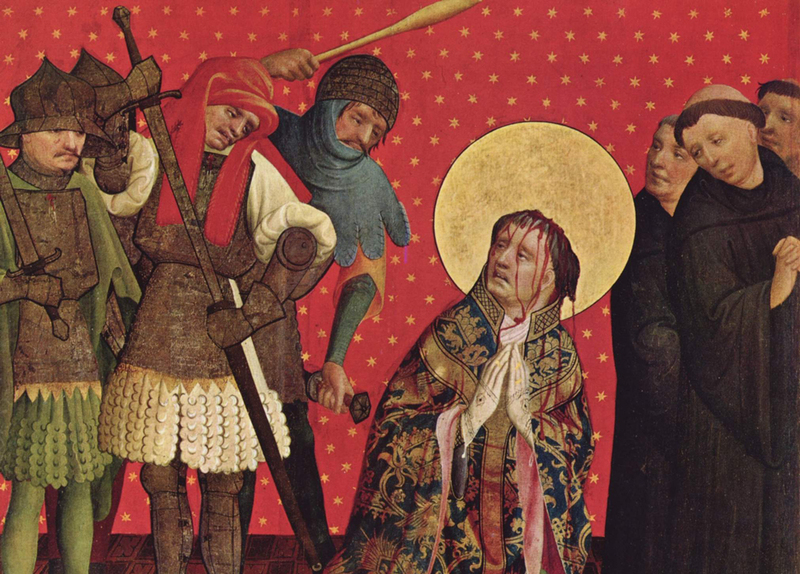 As the great medieval historian and Benedictine David Knowles remarked, Becket did not so much convert as belatedly accept his priestly vocation to defend the church, even to the point of death. Guy may not find the question of Becket’s conversion compelling, but I believe his readers will, and with Guy’s readable biography in hand, they will be able to decide for themselves if Becket truly was a saint. This article also appeared in print, under the headline "Defender of the Faith?," in the September 9-16, 2013 issue. Joseph P. Creamer teaches history and is the senior dean of Fordham College at Lincoln Center in New York City.